Nasal Airway Obstruction gives you the feeling of a congested or blocked nose and substantially reduces the amount of air you are able to inhale. Let’s start with what your nasal passage looks like. Historically, if you suffered from Nasal Airway Obstruction, you had two treatment choices. Home Remedies: Options like breathing strips, nasal dilators, and sprays, that must be used on a continuous basis. Sometimes they do not solve the obstruction issue, and even if they do, they don’t give you a permanent solution. 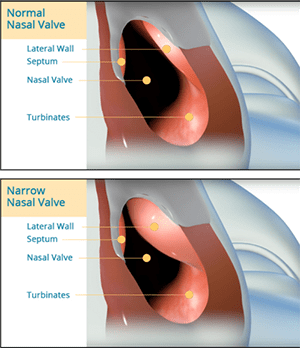 Traditional Nasal Surgery: This is a more radical approach that is intended to be permanent. It does involve pain, a typically lengthy recovery, and end results that are not always curative. VIVAER® offers a treatment for nasal airway obstruction with significant benefits and without the disadvantages. Wouldn’t you like a treatment that’s Effective, Proven and has Documented Success?